We’d like to introduce you to PJ. PJ was a nurse, until she had a stroke earlier this year. The stroke caused an injury to her brain which left her in a wheelchair. It also means she has difficulty speaking. When PJ arrived at the RHN she was immediately referred to our Music Therapy team as part of her rehabilitation programme. As a former nurse, PJ was very keen to get involved in music therapy. Not only would it give her the chance to recover her voice and learn to walk again, but it also meant she got the opportunity to listen to her favourite artist, Lionel Richie. With help from one of our physiotherapists, PJ and her music therapist Helen, have been using Lionel Richie’s music to get PJ back on her feet. By listening to the rhythm of his songs as she walks PJ is better able to control the muscles in her legs, and regular practice has improved her strength and coordination. Helen has also been helping PJ recover her speech, as the stroke left her with a condition called expressive aphasia, which means she struggles to form words. Speech is vital for PJ, and not only socially. During her recovery she is dependent on carers to provide for her needs. If she is hungry or tired it is vital she can communicate those feelings. To help her achieve this, Helen has set everyday phrases, like “I want to go to bed”, to a simple melody. Astonishing as it may sound, PJ can sing her needs perfectly, even though she struggles to say the same thing. With lots of practice we hope her speaking voice will eventually catch up to her singing voice. The Music Therapy team here are always busy. 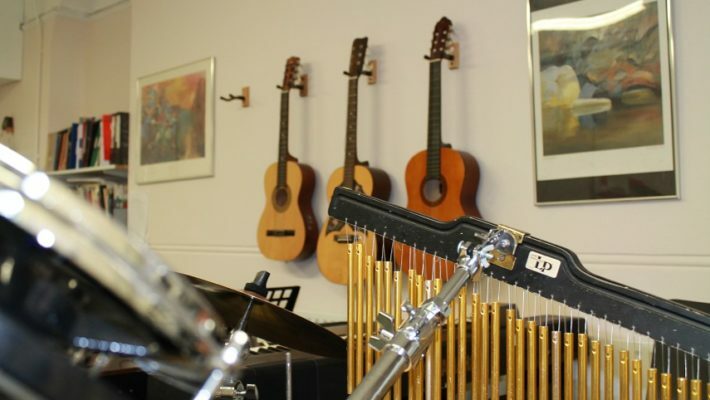 They will hold nearly 1000 group and individual music therapy sessions every quarter. They assist brain injured patients in recovering a huge variety of skills and abilities, from speaking and walking to fingertip control and hand eye coordination. The team also helps patients who are coming to terms with being disabled. Music composition and song writing are just two ways in which patients can express the feelings of frustration and grief that so often accompany brain injury. And they do all of this without any NHS funding. The vital work of our Music Therapy team is entirely funded by supporters like you. This Christmas I am sure you will spend some time listening to music. Whether it’s a church carol service or the gift of a new CD, I hope that you will remember our patients as you listen to your favourite songs, and give a gift in support of our Music Therapy team. Their hard work and dedication throughout the year means that patients like PJ have a chance to enjoy life after brain injury, by giving back to them the basic abilities, like walking and talking, that so many of us take for granted. For our patients, there’s no better gift than that. Whatever amount you can afford today will make a huge difference so thank you for considering the Royal Hospital for Neuro-disability.